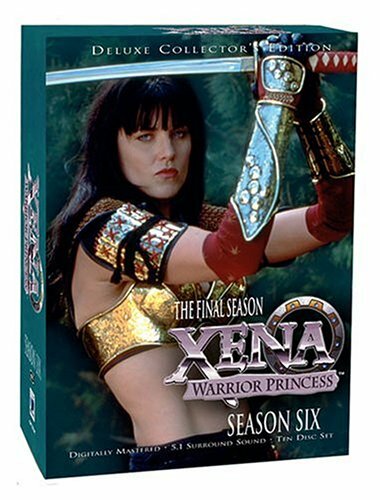 Xena: Warrior Princess (The Complete Sixth Season) - BUY THIS DVD! Deliberately anachronistic and full of high camp, XENA: WARRIOR PRINCESS was spun-off from the similar HERCULES: THE LEGENDARY JOURNEYS but still managed to find an audience all its own. Both series were produced by film director Sam Raimi (EVIL DEAD, SPIDER-MAN). Xena is an Amazon, destined to roam ancient Greece (and other lands as well) with her companion Gabrielle in order to atone for the crimes she committed as a warlord. SEASON SIX was the final season of the fantasy series, and it finds Xena battling her regular enemies as well as traveling to Norway, Africa, and Japan in search of adventure. Tongue-in-cheek comedy, action, and creative re-visioning of familiar legends mark XENA: WARRIOR PRINCESS.